Bartenders and party-goers alike agree, the Taste of Florida is better than it’s competition. We have had TOF in house for one full month now and by Doug’s math in the booklet, we should be selling about 18.5 cases per week as a 1.5mil case wholesaler. The average week of our first month was 31 cases, almost double what we expected. I would have never guessed that there is that much mixer business out there. I wish we would have brought it on sooner, it fits our footprint well and it is profitable, a great combination. 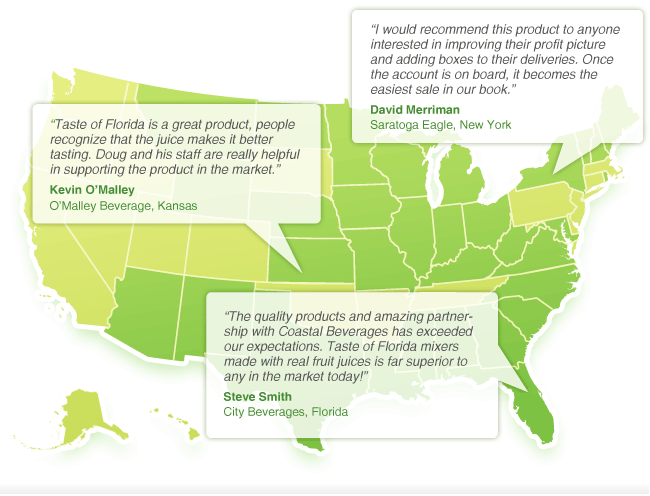 The addition of the Taste of Florida mixers to our product line has been very rewarding. As a distributor that serves both college towns and rural accounts we are able to use TOF both as a competitive package, as well as a very profitable package. It amazed me how easy a sell it was for our reps and how eager an account was to give us a “yes” when we asked for the order. Warehousing so many selections of single bottles could be a cumbersome task but Doug showed us the best way to layout our pick area and it´s worked great. Any distributor that is on the fence when trying to decide if they are going to carry TOF should not delay – grab it now. This product line is a winner! Saratoga Eagle began selling the Taste of Florida Mixers in late March of this year. Doug McWhorter came in and presented to our sales staff and a handful of accounts, sampling his products against Mr. and Mrs. T’s, Rose’s, DeKypers etc. The Taste of Florida mixers won every taste-test hands down. Several of our reps embraced the items right away and have been very successful, adding flavors monthly in accounts that began by trying 4 or 5 SKUs. Many of our “beer reps” are now asking for help in presenting the mixers so they too can share in the incremental cases and commission. The two Bloody Mary mixes, Strawberry, Sour, Peach, Lime, Pina Colada, Margarita and Triple Sec have been the most successful but the others have done well too. I would recommend this product to anyone interested in improving their profit picture and adding boxes to their deliveries. Once the account is on board, it becomes the easiest sale in the book. 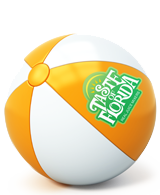 Taste of Florida is a great fit for our portfolio and so much fun to sell. It’s hilarious to watch our customer’s faces when we do a head-to-head competition with what they currently use; they can’t believe their products taste that bad! The creativity these flavors inspire behind the bar and in the kitchen is resulting in some fun and unique beverage experiences for all consumers. I can’t wait to taste more! I have been a professional chef for many years and would have to say that “The Taste of Florida” is by far the highest quality mixes that is now available in our trendy restaurant and bar establishment. Our customers can tell the difference and that is what´s important to us. The “Taste of Florida” natural fruit and juices blends and finishes exceptional well with drinks and culinary dishes. Awesome product! Thank You Taste of Florida !! !..